I listen to a lot of talkback radio because it gives me a feel for where people sit. It's reasonably representative politically. The conversation about the return of Roger Douglas has been substantial over the past week. As you would expect the positions are polarised. But the support is higher than I expected. Sometimes my view of the average intelligence of voters is tarnished by the seeming preponderance of political ignoramuses but this week my faith has been rekindled by the callers who can talk knowledgeably about economic philosophy and are prepared to debate the ideas. What is also needed are a few facts and figures that squash the mindless myths that have grown up around Rogernomics. But let's have a look at the claim that Rogernomics caused widespread and devastating unemployment. 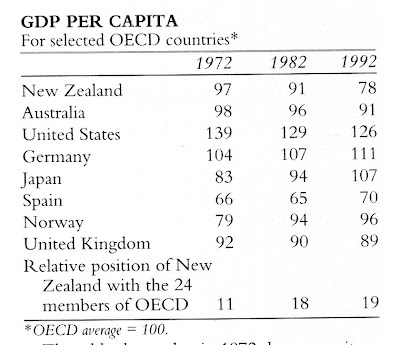 Clearly New Zealand was not alone during the early 90s and not the worst-off either in terms of unemployment. None of the other countries experiencing high unemployment had implemented the sorts of economic reforms NZ had. Roger Kerr talks about the effects of 'disinflation' being significant during this period. Why did new monetary policy focus so heavily on controlling inflation? Rampant inflation during the 70s and 80s had a lot to do with the employment slump of the early 90s. Another caller talked about how New Zealand's GDP per capita tumbled due to Rogernomics. "Rogernomics is why we are now 22nd in the OECD", he said. We had already fallen from being near the top in the 50s to 18th by 1982. I don't want this election campaign to be about fighting past battles but ACT must be able to quickly and simply refute the claims made by those who will attack them. Candidates should remember a few statistical facts that can be absorbed and are indisputable. Without the reforms things would have gotten a lot worse. With them New Zealand's recovery was faster. What a shame Douglas never got the chance to finish the job. What a shame he never got his flat tax in. What a shame Labour have managed to undo much of the achievement by ramping up government spending and regulation. And isn't it great to be having some real debate between left and right economic theory, debate about the future of the country, instead of a personality contest between Helen Clark and John Key? 1/ Redistribution always involves privilege for one and punishment for another with the government deciding who is the winner and who is the loser. It accords too much power to the state. 2/ The dead-weight cost of redistributing money is utter waste. 3/ When people receive money without commensurate effort they work less. That is bad for productivity. 4/ As an attempt to boost fertility rates redistribution to families with children has not been successful. Note some of the most 'family-friendly' European countries have low fertility rates. The US has the highest in the OECD. 5/ WFF has created very high effective marginal tax rates. In fact some people are no better off if they boost their income through advancement or longer hours, as they move into the top tax rate bracket and lose WFF benefits. WFF dulls ambition. 6/ WFF is the hallmark of Labour governments. It is all the old schemes dressed up in new cloths. These schemes have never achieved their stated goals. 7/ Redistribution creates resentment amongst those who are not beneficiaries. In this case young, childless people. It contributes to their motivation to leave New Zealand. 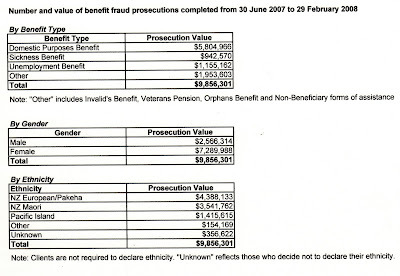 8/ With WFF being used as a voting bribe, the cost of promoting it has been enormous including ridiculous expenses like megabucks to commission a musical theme. 9/ WFF acts as a subsidy to employers. The wrong people (not those targeted) end up benefiting. Look. It is simple. Let everybody keep more of their own money. Let individuals take responsibility for their own decisions. The flow-on will be far more beneficial than any government attempts to grand plan society. Thank God someone of influence is talking sense at last. Again - hallelujah!! It's a good day. The need for compulsory DNA testing to establish paternity is a further unwelcome consequence of the DBP system, says Lindsay Mitchell, welfare commentator. "Since the introduction of the DPB in 1973, more and more women have resorted to welfare to raise their children. The application process involves naming the father of their child or children, with the state seeking recompense from him by way of child support payments. The father is responsible for these payments, which are calculated by way of an iniquitous formula, until the child turns 18 (and sometimes 19 according to circumstance). Naturally, cases arise whereby the father wishes to confirm his paternity. To deny him this right is indefensible. However that is what the courts have been doing if the mother refuses consent to a DNA test." "Before the DPB, income for single mothers came from work or temporary social security assistance. There was far less incentive to have a child alone or leave a relationship. Whereas in 1966 only 7.5 percent of families were single parent, today the figure has grown to 28 percent. Consequently the number of disputes over parentage has also risen." "Fathers should financially support their children. But while we have a system that encourages women to have babies on the back of welfare, with the estranged father expected to recompense the taxpayer, it is imperative he is able to confirm that he is indeed the biological father. " "If state assistance was returned to a short term hand-up, far fewer people would become single parents and far fewer paternity disputes would occur." In light of the post below it is entirely reasonable to expect that a good number of children have mothers who have lied about their parentage. It is sad that social policy which encourages such exploitation had led us to a situation whereby courts now need to be able to issue DNA-testing orders that confirm a child's biological father. It's a simple matter. Fathers have a right to know. Well done Judy Turner. And Judith Collins, if this law change is what you "have been talking about it for a long time" why didn't you draw up a bill? Don't try and steal United Futures's thunder. In this land where feminist doctrine dominates public policy, where men have supplanted money as the root of all evil, where the bond between biological mother and child is sacred but bond between father and child is disposable, isn't it surprising to find that women are almost 3 times more likely to defraud Work and Income? Perhaps the women who cheat and steal are models of good behaviour in every other respect. A group of Pacific men band together to persuade others that being tough guys isn't the way to raise a family and they call themselves .... Gladiators?? "I am advised that the Ministry of Social Development's current statistical system only holds complete benefit history for people who commenced their first benefit since June 1996." "The following tables only record benefits that commenced after January 1 1993. As I advised you in my previous response....the Ministry does not hold accurate electronic information on benefit recipients granted benefit prior to this date." What a piss-poor performance this is. At this rate they will soon hold no data. Or none they are obliged to release. Based on my information, at December 2006 at least 37,600 or 37 percent of current DPB recipients had first received a benefit as a teenager. If complete benefit histories could be accessed the percentage is likely to be much higher. The DPB is a trap for teenagers. And it produces families from which much social dysfunction emanates. The emotional and economic costs incurred by these families could be significantly curtailed but nobody has the guts to do anything about current policy. First, an explanation of why so little blogging. As mentioned earlier I took a local shop to have a painting sale two weeks ago. The sale went moderately well but the interest in commissioned pastels was enormous. Hence I have extended the arrangement and am working there every day. But I did want to respond to this comment from yesterday. Did anything come out of the ACT conference, or from Douglas's mouth to say you're going to reduce the size of the State? NO! Like the socialist Key, you're still talking about merely curtailing it at the level it is now. The media, as I pointed out yesterday, didn't report on the content of Rodney or Roger's speeches. While some policies will not go as far as I and other libertarians want them to, a gradualist doesn't take an all or nothing approach. The education policy, detailed in Rodney's speech, doesn't abolish state schools but it does open the door to more private schools and deal with the inequity of taxpayers paying twice for their children's education. Parents would no longer be forced to send their children to substandard schools. It wouldn't be just the 'rich' who would have choice. National, on the other hand, can't even lend their support to bulk funding any more. For the media the ACT conference was all about the return of Roger Douglas. That is what they have covered, speculating on his reasons for returning and the possible implications. The media are not particularly interested in ACT ideas and ACT policies. Or one would have to make this assumption based on their coverage. It's personalities and political shenanigans. Roger Douglas laid out clearly in his speech what is wrong with this country. As I listened it struck me that Labour has done an awful lot of damage in nine years. But nine years is a long time and much of it has already receded into the murky past and we've forgotten. The results are low productivity, low wage growth, huge rate rises, substantial increased costs to doing business; we trail most other OECD countries in many areas - not just GDP per capita - then we have violent crime increasing, social problems escalating, the loss of so many skilled people. It doesn't have to be like this. But people get up and go, admittedly to countries with some of the same problems, but they feel emotionally disconnected from those problems. It's a relief not to have to care in the same way because it isn't your country that is failing to deal with problems that are fixable. So am I standing? Hell yes. I don't want to. But I have no choice. As Roger put it, we can't keep standing on the sidelines. And if he can find the energy and time to make a commitment to make New Zealand a better place for everybody then so can I. Not bad for a 1% party.